Managing Configuration Manager is like operating a high-speed train with new monthly updates to the Technical Preview build and 3 yearly updates to the production build. No matter how smooth and easy the upgrade process has become, an upgrade is still an upgrade and things can go wrong (read: backup/snapshot first). With the release of Technical Preview 1705 (and now also found in production build 1706), the Configuration Manager Update Reset Tool – CMUpdateReset.exe were released. The tool will assist if you experience issues with new upgrades/hotfixes stuck in download. 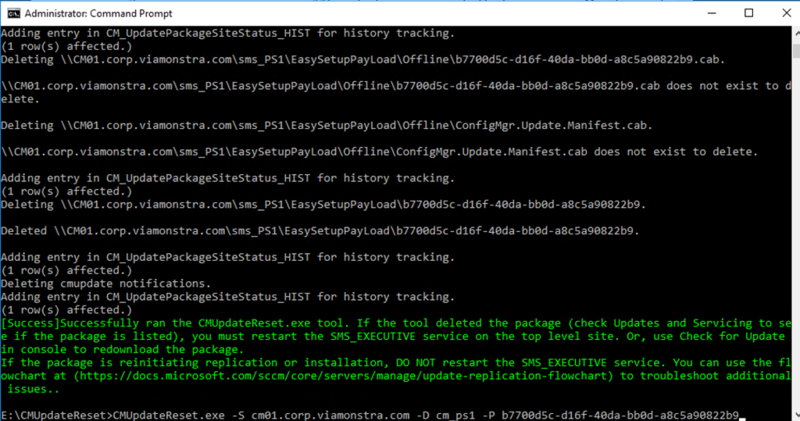 You’ll find the tool in .\microsoft configuration manager\cd.latest\smssetup\tools. I recently had to use the tool during an upgrade, where the state were in downloading for more than 24 hours. Prior to running the tool, navigate to the easysetuppayload folder and take a note of the folder name (the guid). in my example I ran the following to reset the process where after everything worked like a charm. Great info- If we are trying to get the download for 1706 from 1702 and have this issue, how do we get the tool? Is there a separate release of CMUpdateReset or will we need to install a newer CM release in a VM to grab this file? I had the same issue updating 1610 to 1702, the installation was tuck in pre-req check or installation, I tried to find this new program through internet but no way, so I created a Virtual Machine with fresh installation of SCCM and I was able to install 1706 on it only for retreiving CMUpdateReset.exe, after that I copied CMUpdateReset.exe in the production SCCM and run it with -FDELETE parameter and finally the program cleaned up my SCCM and successfully download and done the update. I shared for you the program so you can solve your issue. enjoy! 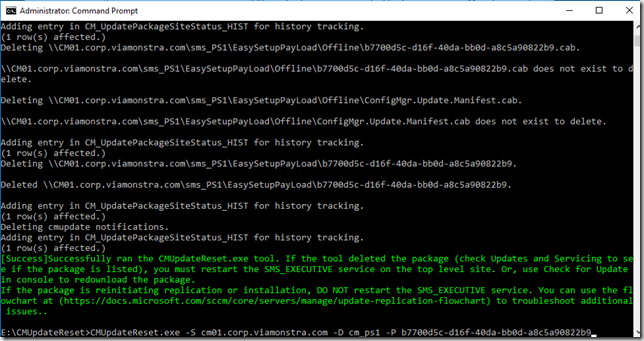 Nope, no luck, the Reset tool seems to work and resets everything, but the upgrade to 1706 sticks everytime. The current error in the Logs is that the Download from Microsoft returns a 404, cannot find the file. But I havn’t got problems with sql and wsus works fine. What to do? Obviously no one in the net has solution! What to do Im driving mad! I have upgraded the CM from 1702 to 1706, after upgrade i m facing issues with OSD. I would like to know if it is possible to stop the package from replicating in order to run the tool successfully. I have the same issue but this was when trying to run the pre-req check. Now I am stuck! It seems that it is a coincidence that the new feature for site server high availability was enabled but I have not configured it yet. ﻿﻿ INFO: Prerequisite rule ‘Domain membership’ will run for easysetup upgrade. ﻿ INFO: The rule ‘Domain membership’ has been run on server ‘Inser Server Name’, skipped. 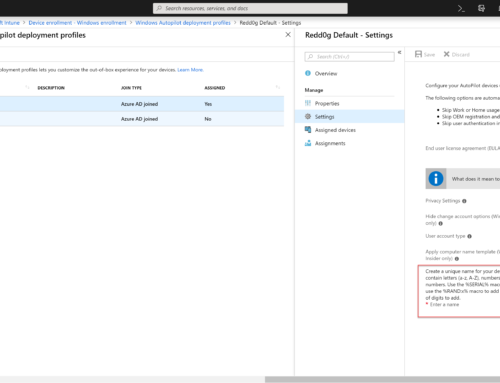 ﻿ INFO: Prerequisite rule ‘Windows Failover Cluster’ will run for easysetup upgrade. ﻿ INFO: Windows Cluster not found on Insert server name. ﻿ INFO: Prerequisite rule ‘Pending system restart’ will run for easysetup upgrade. ﻿ INFO: The rule ‘Pending system restart’ has been run on server ‘server name’, skipped. It seems like the service update manager restarted and the update continued after being stuck for a couple hours. What happened is when the update was updating the DB, It lost connection with the DB server and started throwing a bunch of errors on the CMUpdate log. The DB connection was lost for only a few minutes but the update didn’t show signs of continue for a couple hours but it seems to continue where it left it and it is about to finish. I am running CM 1802 and it is stuck running the prerequisite checker for 1806 and I am attempting to restart the upgrade process by running CMUpdateReset.exe. Has anyone had to run CMUpdateReset.exe against a database that uses a custom port? When I run CMUpdateReset.exe, I use the syntax -S sqlservername.domain.com,14444, which is the same format I used during CM installation, but it returns the error “0x80070057 – SQL server FQDN is invalid. Please provide the top level site SQL server FQDN and Database name.” If I remove the custom port from the command line, it times out because it can’t establish a connection to the SQL Server. No other log entries are made. I have no choice in using the SQL custom port.